The Flying Boat Forum from www.seawings.co.uk • View topic - Rochester NY - new center of Widgeon universe? Anybody know anything about a guy named Mark Rueckwald of Rochester, NY or his companies Seaplane Works Inc. and Rochester Amphibian Inc? Apparently, in 2010 Seaplane Works Inc. bought up most if not all of the former McKinnon STCs for the G-44 series. and SCAN 30 N890* (c/n 36) *incorrectly identified in the FAA registry as a (mfg.) "Grumman" (model) "SCAN Type 30" when it was actually built by SCAN under license from Grumman and technically speaking "SCAN" was the actual "manufacturer". Also, according to The Daily News (online edition of a newspaper there in Genesee County NY), Rochester Amphibian Inc. last year leased 16,250 sq-ft from the local airport authority to build a new corporate hangar. Just wondering what kind of business he's starting - restorations and sales of Widgeons, maybe? Re: Rochester NY - new center of Widgeon universe? I just thought I would take this as an opportunity to introduce myself. Rajay is correct that Seaplane Works did purchase all of the STCs that were formally owned by Ace Aviation. Furthermore, Rochester Amphibian did purchase the inventory of Widgeon parts from Aircraft Specialties in Ft Pierce, FL (formally Mirabella) which included N52833 and N890. The original plan was then to rebuild (from the ground up) two Widgeons and then keep any remaining parts as spares. As the project started maturing, the financial picture started to really get out of hand and the projects were cancelled. At this point of cancellation, the purchase of N612GW (aka N144GW) was made. We are also not going to start a business of rebuilding Widgeons as there are already people doing that. However, I do see that we are possibly at another changing of the guard with this airplane as the last generation is gradually retiring and all of those years of experience lost. With this, I urge everyone to do what they can to maintain this fading knowledge and keep them in the air and on the water!!! There are a few of the younger crowd that maintain a dedicated interest in these airplanes. I for example am 33, grew up in one, and after a bit of a life detour am working my way towards obtaining a type rating and eventually Widgeon ownership. There's a long way to go, and I'm still not quite sure how I'm going to be able to afford this, but the determination is there. Sheesh, you were what, 8 or was it 10 the first time I saw you ? ...and I still make quite an ugly hood ornament. I take it you two know each other, then....? You could say that, he's the son of a good friend of mine. The first time we met, he was in a similar position on the bow of a Widgeon and I remarked that I really liked the airplane but it had a real ugly hood ornament. Jr. took great exception to that and ran in the house crying and started packing his bags to go home. His dad went in and explained I was only kidding and that if he wanted to hang around airplanes he'd better get a thicker skin because the jokes and the business can be mighty rough sometimes. I apologized to him when he came back out though I don't think he really accepted it at the time. He eventually got over it and in time became somewhat of a joker himself and got me on a couple occasions later. Since then it's been sort of an inside joke. This picture was taken a couple years later. 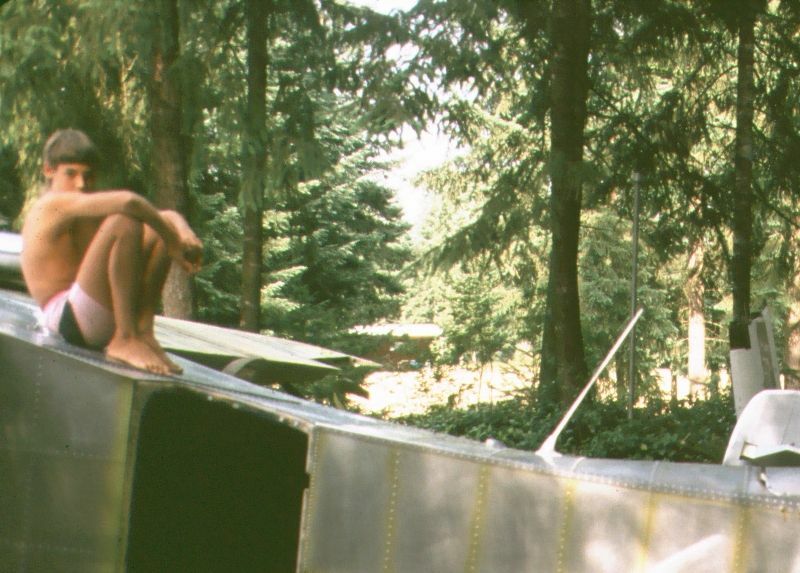 Growing up in and around that airplane, you couldn't help but kind of take it for granted.